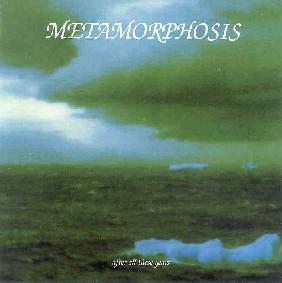 Metamorphosis - "After All These Years"
Metamorphosis from Switzerland is essentially prog rock. It is the brainchild of Jean-Pierre Schenk who formed the band after years of performing and recording under different projects. After All These Years is a project that took twenty months to create and the sound and production work is stunning. It relates to Pink Floyd in a big way, an Animals sound is prominent on several tracks. The work is of a high calibre and the tracks stir fantastic visions of colour. My only qualm is the vocals and lyrics. There is nothing bad about them at all and they fit the music perfect. It is just I am not a big fan of Yes and other prog rock bands so I don’t find them appealing. On the other hand, the Floyd lead moments are done very well; I just do not rate prog rock. The line up here is Jean-Pierre Schenk: Vocals, Backing Vocals, Keyboards, and Drums. Giova Esposito: Guitars. Dominique Schlafar: Bass. On the track "New Lords", David Grillon plays Guitar, and Milena Zaharieva plays Flute. This album is a prog rock fans dream I’m sure. I can even get away with a lot of it, bar the song moments, which I always find is the case with prog rock. That is my view. Others love it for that precise thing so I can say that it is prog rock heaven. The keyboards are very spacey/atmospheric in that Pink Floyd Shine On kind of way. The guitars are the same, very Dave Gilmore, but a lot has been lost in the mix as far as solos go on things. Maybe it was meant to be like that. Regardless it sounds good. Genesis and Pink Floyd are listed as Jean-Pierre’s influences so you can decide for yourselves what type of prog it is. My descriptions term it prog and progheads know what type they like and Metamorphosis is in the realm of Floyd bar vocals which are more ballad orientated in a maybe Yes vein. For more information you can visit the Galileo Records web site at: http://www.galileo-records.com. Contact via snail mail c/o Patrick Becker; Galileo Records; Alpenstrasse 22; 2540 Grenchen; Switzerland.